Straight or stack bond tile pattern is the most common and simplest tiling pattern in the world. This pattern has tiles installed in straight lines so that all the grout joints look like a grid. This means that the corners of each tile are lined up with each other which provides a simple, clean and the same time modern appearance. The straight lay tiling pattern is the most versatile layout option for tiles. It can be used for any room, floor, wall or space both indoors and outdoors. 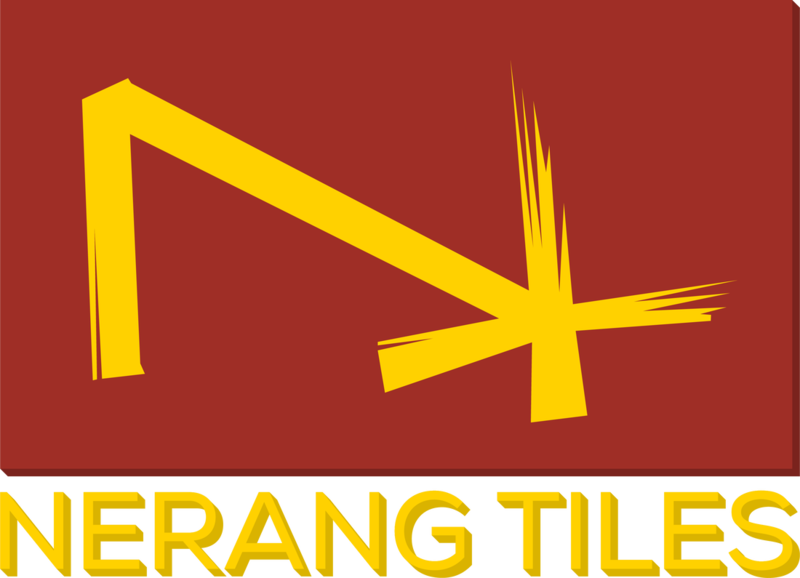 It is also the most cost efficient and affordable option as it is the easiest for tilers to lay and has the least amount of wastage when cutting. When tiling a in a straight or linear tile patter we recommend allowing 10-20% extra for cuts and breakages depending on the space you are installing tiles. Remember that different batches may have slight colour variation that will show up in the finish product. Straight lay tile patterns will show different batches so make sure you check the batch number on the packaging of your tiles. The diagonal tile layout pattern is very similar to the straight pattern with one minor difference, the tiles are installed on a 45 degree angle by turning square tiles into diamonds. If you are looking to make a room feel bigger or stretch it out, no layout pattern is more effective than the diagonal pattern. This is because when you look at the pattern your attention is drawn or focused on the widest part of the tiles while at the same time the eyes will see the grout lines spreading across the width of the room at wide angles. This mathematical and visual trick of perception makes you think you are looking at a space that is much larger. This tile layout pattern is perfect for floors in entryways, hallways and small bathrooms as well as in the shower. These are all spaces that tend to be smaller or narrower than the rest of the home. The herringbone tile layout pattern feels like it has exploded into fashion in recent years becoming one of the fast growing and most popular tile layout pattern, particularly for feature walls and small room floors. The herringbone pattern is perfect for hallways or outdoor paths though because the 'V' pattern that it creates acts like arrows pointing you in the right direction which is very clever. However it is important not to confuse the herringbone tile pattern with the Chevron patter, they are distinctively different. To create the herringbone pattern, lay any type of rectangular tile in a zig zag pattern, it is simple. This is done by taking any sized rectangular tile and turning one so that the two are perpendicular to each other, align them along one side and repeat. This will basically create a repeating L-shape with each two tiles installed. The herringbone tile layout pattern also helps in making rooms appear larger than they seam. This is because the eyes do focus on the V shape instead of the narrowness of a room. By focusing on the pointing arrows a space can appear long and large. If you are laying tiles in a herringbone layout we recommend that you allow at least 20% for extra cuts and breakages because more cutting is involved. The Chevron tile pattern is very similar to the herringbone pattern when explained so it is important to understand their distinct characteristics to avoid any confusion. The confusion is compounded by the fact that the Chevron pattern is often referred to as French Herringbone. Both the Chevron and Herringbone patterns are described as a zig-zag visual. The difference can be subtle, but you only have to miss-specify it once to realize how significant the difference really is. In a Chevron pattern, the zig-zag creates an exact “V”. The ends of two equally sized tiles are cut at an angle and fitted together to create a point. The opposite ends of the tiles are cut similarly so the detail is created across the floor or wall. In contrast to the herringbone tile patter, the ends of the tiles are not cut and the square edge of the rectangle tile just adjoin the side or length of the other tile. Because we are cutting the ends of each tile instead of laying them at a 90 degree angle like in the herringbone. We recommend that you allow a little extra for cuts and breakages when laying in a Chevron tile pattern. The weave. The basket weave is often used in applications where the design is aimed at creating a chic feel out of the early nineteen hundreds. Think traditional styled homes with intricate natural stone textures in the hallways, outdoor entertainment areas and foyers. However the weave can be modern and transitional at the same time. The colours and pattern you choose will greatly determine how successful this pattern will be. The weave is created using rectangular tiles. Simply place two tiles next to each other to form a square and then another pair of tiles laid at 90 degrees to the first pair. Then continue and alternate to repeat the pattern as you go. This will give the impression that the tiles are woven over and under each other like a basket. We recommend allowing at least 10-20% extra for cuts and breakages with this tile pattern. One of the most retro and intricate looks you could choose for a tile is the Windmill tile layout pattern. It is difficult to install and a complicated pattern that really pays off. ​The simplest way to explain the windmill tile layout pattern is to break it up into individual square shapes. In each square there are four rectangular tiles and one small square tile placed right in the middle. The rectangular tiles circle the square tile to create the larger square shape. Hot tip, use a small square tile with a different colour in the middle to the rectangle tiles to make this pattern stand out. The pin wheel tile pattern is very similar to the windmill pattern. This design will use a small square tile surrounded by larger format square tiles to create the effect of a spinning wheel. We recommend using contrasting small and larger format square tile colours to create a stunning design. Although this design is not overly complicated it is important to plan it carefully and employ a tiler with decent skills. It is not a very common design which makes it difficult to install but unique and wonderful to look at. Stretcher Bond or brick bond layouts are very popular with rectangular tiles. To plan the layout just align the end of each tile with the centre of the tiles that are directly below and above it. This will create a staggered brick laying look. We recommend thinking about using this tile layout pattern when installing rectangular tiles on the floor and any rectangular shaped tiles on the wall, especially subway tiles. Please allow at least 15% extra or cuts and breakages when laying stretcher bond or brick bond tile layours as they do tend to have a few extra cuts when the pattern reaches walls. Not commonly seen but more common with traditional themed homes where the natural stone and granite look tiles are used. The cobblestone tile layout pattern employs rectangular tiles laid in the herringbone format. In addition, around the edges of the herringbone format we have smaller square tiles which create a larger pattern. Sounds complicated and expect to have additional costs from a tiler when installing, it takes time and though but really looks stunning when installed. It would seem odd to have two different tile shapes laid in a brick bond or stretcher bond tile layout. However that is exactly what the English Bond pattern is. The English Bond pattern uses alternating rows of rectangular and square tiles. The square tiles are centered on the rectangles and the ends of all the tiles line up between the rows. This pattern is great for creating continuity throughout the home by taking your floor or wall tile onto the wall and vice versa. A difficult tile layout pattern to explain so it is best illustrated with the image above. Sold by the set (metric sizing) 0.72m2. 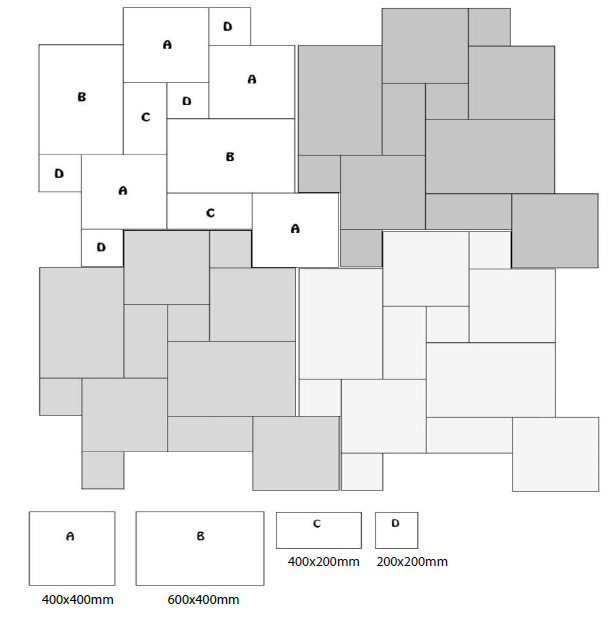 Each set contains 2 pieces of A and D and 1 piece of B and C. However you could also find different sized tiles in the same design and install the in the layout shown.